Follow The Leader – I Can Do It! We love to go cycling as a family. 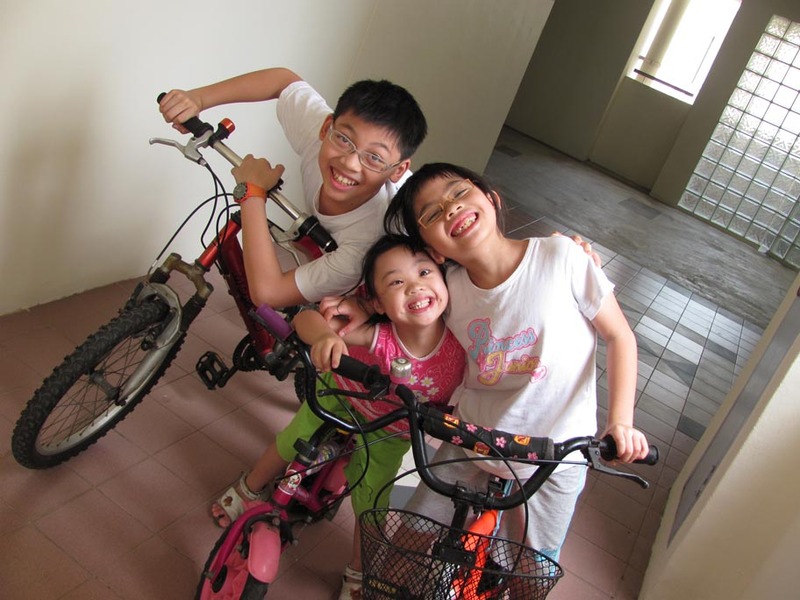 As Li-Ann still can’t cycle, she has a special seat just behind daddy. Last year, it was really encouraging when Rebecca, having better stamina, could cycle longer distances. We then began to bike more frequently and further. *Look out for the children. Being right behind, I can see how the children are coping and will encourage them, especially Rebecca, when required. I would do that, especially when we meet with slopes or approach road junctions. I will get nearer to Rebecca, prep her ahead of time and tell her what to do. I will also alert John when he’s a little too slow and Rebecca is too close behind him. Once, I spotted LA’s seat belt loosening and warned daddy about it. I thank God for the strength to keep the children and myself going. We probably will ride our bikes together often – giving thanks for our family togetherness, the plants and animals He made, the exercise we get and also for the safe neighbourhood and country He has given us. Now, we only hope that Li-Ann can learn to cycle soon, before she’s too big for the seat on daddy’s bike. Will you pray along with us for her?